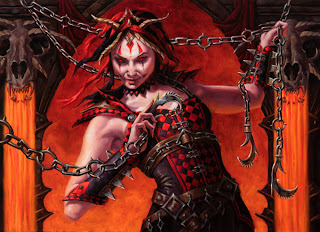 The full spoiler of Return to Ravnica cards is up at http://www.wizards.com/Magic/TCG/article.aspx?x=mtg/tcg/returntoravnica/cig There is some gorgeous artwork in this set. Here is my humble contribution. Original is 13" by 18" oil on paper on board. Wow, there are so many beautiful images! I was just curious, generally do you choose which card you would like to paint or are they assigned to you? I first saw your work in Magic: the Gathering cards, which led me to finding your website. Just wanted to tell you that your work is awesome.